Iseli Company serves the Valves, Electronics, Instrumentation, Medical, Consumer Products, Aerospace/Defense & Automotive industries… See our capacity for each industry below. There is rarely a more demanding application than with the performance requirements of valves. Product failure can lead to catastrophic emergencies. That's why Iseli is proud to be a major supplier to several major manufacturers of valve components, including Parker Hannifin and O'Keefe Controls. Valve components are manufactured to tight specifications, typically in aluminum, steel and brass alloys, with secondary operations such as finish grinding, heat treating and anodizing. We pride ourselves on producing components with excellent fit and finish that hold tight ID/OD finished dimensions. Environmental testing including salt-spray and high humidity, is available depending on your requirements. Some of the world's leading electronics manufacturers such as Texas Instruments, Honeywell, Litton, ITT-Cannon, Souriau, AT&T and many others rely on Iseli for precision components for many telecommunications, wireless and popular electronic products. High yields are consistently achieved working to tight tolerances in many varied materials. We have extensive experience manufacturing electrical components for a wide range of termination and connection schemes. We are experts, for instance, in contact pins and sockets. We understand the special needs of producing tiny, but reliable parts with multiple operations including milling, cross drilling, slotting and crimping. In addition, we carefully control heat treating to match your specifications. Working with Iseli assures you of components with superb fit and finish. 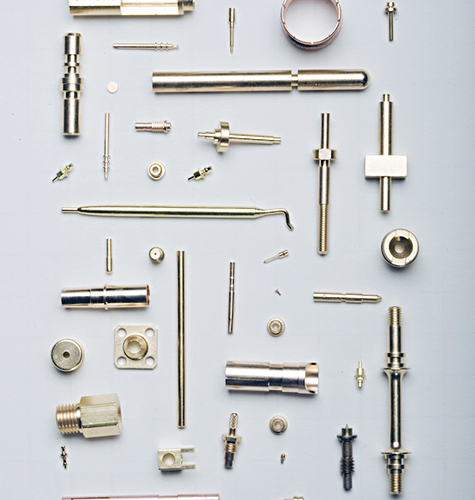 You can count on Iseli's experience with many varied materials such as beryllium copper, brass and stainless steel to produce quality components used in instrumentation and systems. We supply leading companies such as Danaher, Honeywell, Texas Instruments, Eaton, GE, and Rockwell International in the instrumentation industry. Our precision manufactured electronic and mechanical components include mounting parts such as spacers, contacts, stands-offs and threaded inserts that are used in RF, laser and ultrasound systems. We strictly adhere to your specifications for geometry, shape and tolerances based on a wide range of material and any finishing steps necessary. As part of our broad experience, we have manufactured components for digital antennas and contacts for pin diodes. We also manufacturer standoffs and circuit breaker components made with thread rolling or threat cutting technologies. Iseli is responsive to your needs for quality products at competitive prices, with on-time delivery. The medical industry is a primary growth sector for Iseli. We play an increasingly key role in supplying precision machined components used in medical monitoring systems. High reliability is essential for all medical components we produce. We meet stringent standards for medical products as dictated by their designers. CNC machining is necessitated in many cases to hold the exacting dimensions required by the industry. Conformance to rigid standards in materials and tolerances is the key to providing specialized parts for each specific need for our medical industry customers. Iseli's reputation for quality, delivery and service has given us the opportunity to manufacture components for many leading consumer products companies around the world. We're flexible and can provide fast turnaround, which is important in the rapid product development cycle in the competitive consumer products industry. Our components are built into appliances, home equipment, sporting goods and many more product categories. With complete responsibility from start to finish, Iseli can provide components made from a wide range of materials, with complex machining operations, and special finishing operations that you may specify. Iseli has been a leading provider for many decades of components to major companies in the Defense and Aerospace industries. As one of the largest manufacturers of parts for fuses and triggering mechanisms, we understand the importance of adhering to strict military specifications. Our quality systems are in accordance with MIL-I-45208. Product reliability is of the utmost importance, and we are proud of our reputation for quality. We also are committed to delivering on time on the date specified, and ship-to-stock as directed by our customers. Tyco, Parker Hannifin and Champion Automotive Parts are just a few of the leading companies that rely on Iseli for precision components at competitive prices. As a ISO 9001:2000 Certified company, our internal systems are designed to support your supplier requirements.